Dr. Verma is a 1994 graduate of Northwestern University. Upon graduating, he received his hospital dentistry training at Ohio State University Medical Center. The extensive training involved surgical skills and intravenous certification. During his residency, Dr. Verma served as chief resident and as an assistant professor to new residents for five years. He went on to gain a fellowship in the Academy of General Dentistry. While in the US, he actively supported organized dentistry by serving on the New Dentist Committee for the Ohio Dental Association, focusing on establishing a voice for new graduates in the association. Dr. Verma made a transition to relocate to beautiful BC in 2000, where he established his practice in Langley. 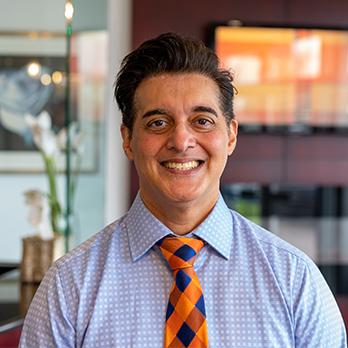 In the same year, Dr. Verma became involved with the Fraser Valley Dental Society where he then became an executive member in 2001, contributing to the continuing education committee and the production of the society program. He has actively been involved with a number of professional organizations such as the Ohio Dental Association, American Dental Association, Academy of General Dentistry, Academy of Hospital Dentistry, Academy of General Dentistry, and the Chicago Dental Society. Recently, Dr. Verma served as a representative from the Fraser Valley and assisted with the Audit Committee for the BCDA gaining great respect for the work that is done for its members. Realizing an interest in the regulatory aspect of dentistry, Dr. Verma took the opportunity to serve as a representative to the College for the Fraser Valley from 2008 to 2010. Since then, he has served as the Fraser Valley Dental Society President, and continued at the College, serving on the Ethics Committee until 2016. Dr. Verma is married with two children. He is active with volunteering at his children’s school as a board member and coaching them in league sports for the past several years. He stays active skiing, scuba diving, swimming, and playing soccer and squash. You may even convince him to play his saxophone!